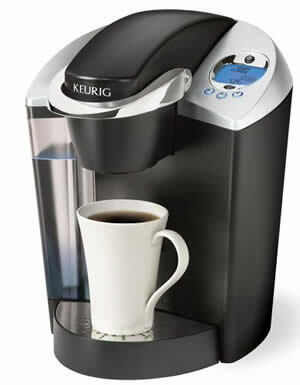 Keurig B60 Coffee Maker is one of the best values in the Keurig line of single cup coffee makers. This particular machine is in the home use line-up of coffee makers. Using the K-Cups, a patented filtering process that delivers a single cup of coffee at a time, the Keurig B60 Coffee Maker will brew a 5.25 oz. intense cup of your favorite coffee mix, a 7.25 oz. regular, or a 9.25 oz. travel mug of your favorite blend. As with the Keurig B40 and the Keurig B70, the pressurized hot water fills the patented K-Cups of your favorite flavor, dispensing one perfect cup of coffee every time. Do you have your own favorite blend of flavors not available in the K-Cup? Add a “My K-Cup” that allows you to fill it with the coffee flavors and extras of your choice to brew the perfect cup of coffee for each person in your house hold. The Keurig B60 offers an adjustable brewing temperature for those who like their coffee extremely hot at 192° and for those who like it a little on the cooler side, 187°. While the cooler 187° is great, for a more intense flavor, you might want to choose the 192° option and let the coffee cool down a bit, instead. If you prefer a cooler cup and a milder flavor, the 187° option will be a dream come true for you. This machine has an LCD display that can be viewed at night due to its blue backlighting and it is programmable for your first cup of coffee in the morning or for your afternoon break-time cup of coffee. The 48 oz. water reservoir is removable as is the stainless steel drip tray. The chrome that lines the outside of this coffee maker gives a hint of finesse to your counter top appliances. About the size of a cookie jar, the Keurig B60 coffeemaker is not only a great coffee maker but also a convenient size for a countertop appliance. It is approved for home use only and will need to be primed before you use it the first time. Keurig B60 reviews give this machine a five out of five star rating – a perfect rating telling us that it just doesn’t get any better than this. Because there is a 30 day money back guarantee, you can purchase the Keurig B60 special edition single cup coffee maker with confidence. If for any reason, it fails to meet your expectations, you are protected for the amount of money you have spent. Looking at the advantages, the Keurig B60 Coffee Maker can make a great addition to a morning coffee menu. Usable for that one perfect cup of coffee at a time, it will be hot and ready when you are ready for it. Investigate on your own today and try the perfect cup of coffee and its maker!